By Gokhan Ergocun – Anadolu Ajans? Producers and exporters from 57 Muslim countries have been encouraged to secure halal certification to take advantage of the lucrative $4 billion global market. “There are no Muslim countries among the 10 biggest halal exporters in the world,” Assad Sajjad Zaidi, CEO of International Halal Center, told the World Halal Summit in Istanbul (WHSI). He cited a lack of global branding in the Islamic world. India, Brazil, Austria, the U.S., Argentina, New Zealand, France, Thailand, the Philippines and Singapore are 10 the biggest exporters in the halal market, Zaidi said. He said these 10 countries’ share of the halal market was 85 percent. India is the biggest halal meat exporter and Thailand is the biggest halal product exporter, he stated. He also said Muslim countries have a 15 percent share in all halal markets; Malaysia and Indonesia are the two main countries among these. Halal is not limited to meat only; products with pig derivatives, such as bone or skin, are used in several areas including paint, toothpaste, medicine and beauty products. A halal-certified product means it is compliant with Islamic law which has a direct impact on how products are produced, processed, distributed, stored, sold and consumed. Turkey announced recently the country’s first Halal Accreditation Agency (HAK) which will serve Muslims across the world when it opens before the New Year. Turkish Economy Minister Nihat Zeybekci also said non-Muslim countries’ firms have 80 percent of $4 billion halal market. Turkey and other Muslim countries should have a bigger share in the world halal market, he added. With the HAK, Turkey wants more Muslim countries to win a better share of the halal market. The WHSI and the 5th Organization of Islamic Cooperation Halal Expo began on Thursday. Anadolu Agency is the global communications partner and more than 200 firms and brands are participating. 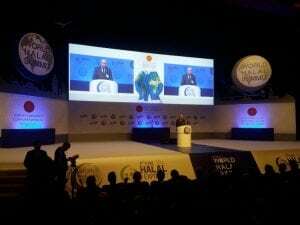 High-level speakers from more than 80 countries will discuss issues surrounding halal food, pharmacy and medicine as well as Islamic finance, tourism and textiles until Saturday.